This ocean front unit has been thoughtfully remodeled and designed to be your home away from home. Elegantly appointed with modern contemporary Beach Décor. You will be delighted to prepare meals in the fully equipped, spacious kitchen that boasts all top of the line appliances, granite counter tops, and custom cabinetry. A good night’s sleep awaits you here in the bedroom furnished with a brand new King Size bed. The remodeled bathroom reflects attention to detail…with granite counter tops! All furnishings are newly purchased which includes a 50" HD TV and a DVD player. For your added comfort, offering FREE WIFI along with FREE Unlimited long distance calls to the US and Canada. Air-Conditioner located in the Living room. 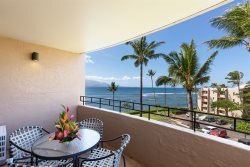 This lovely unit is located at a prime ocean front resort, where access to the longest sugary beach on Maui is just a few minutes stroll away! Whether your pleasure is a romantic stroll on the five miles of sandy beach or sunbathing by the pool, the easy convenience of relaxation just can’t be beat! You will be just as thrilled by the LOCATION of our condo! If you’re craving to know more about the Hawaiian Marine life, the Maui Ocean Center is just an easy walk away. This condo is centrally located means you will be conveniently close to just about everything! Explore popular destinations with ease like the historic whaling town of Lahaina, Kihei, Wailea and Kaanapali. The airport is just a quick 15 minute drive away. Need to stock up on groceries and supplies? Costco, Whole Foods, & Walmart is also just a short 15 minute drive away. Whether it be a romantic getaway or a family vacation, this ocean front retreat offers all the amenities to be your haven for rest, relaxation, and …Aloha! Oceanfront getaway. We didn't want to leave! The condo was beautiful and a great location, it was perfect for our girls getaway. We instantly felt like we had our own little home on Maui. The view was amazing, I loved drinking coffee on the balcony and listening to the ocean in the morning. The condo itself and the building were clean and well maintained, plus all the people were super friendly and helpful. I would highly recommend this property! Hoping I get to come back in the future! Beautiful view! The condo was spotless and had everything we needed and more. The view was amazing and the location was great, not too far from other beaches and restaurants. We did not rent a car, due to a short stay but if you plan to stay for longer then 4 nights I definitely recommend renting one. Wonderful Condo in Ma'alaea! This condo was perfect for my husband and myself. It was quiet, comfortable, clean and had everything we would need for a two week vacation. We love Ma'alaea and this was our second stay in the same building. It was nice to go back to the same complex and have everything be familiar. Incredible, relaxing, great view, great interior! This place is absolutely magical! The interior is breathtaking, along with the view from the lanai. The location is awesome with food within walking distance along with many adventure options right there in the harbor. I would recommend renting a car to travel around the island while you're here. We had just the best time and the condo is decked out with everything you could need. There are chairs, body board and towels for enjoying the beach. We were able to make our own meals with the fully stocked kitchen and had the best night sleep. Waking up early to see the sky begin to lighten over the water was just a dream. I will ABSOLUTELY be back to this place as soon as possible.